India is is one of the fastest growing nation in terms of Technology. Even now, it is one of the biggest nations where the IT sector is concerned. In many ways we are the backend of the world. While this may seem negative it is not just a big responsibility but also has been a huge part in the growth of the country as a whole. All the data and information that is going about in the world goes through India at one point or other. This growth brings an obvious question. With so much data going through India, how much secure is this data and how secure are the people of India in terms of online safety. A recent report, jointly prepared by IndiaWatch and ClubHack, throws some very interesting findings in this regard. 89% of total respondents had concerns for security knowledge and lack of awareness. Government needs to step up and learn more about technology and realise the critical issues like poor infrastructure, useless policies and skill shortages. Government, corporations and people should realise that the assumptions of ‘real’ world do not hold true in the online world. The first concern is that of awareness. While it is considered the best way to protect it is also the most tedious one. Learning about new technology with an open mind and going to experts where the government does not have proper knowledge. Problem with government is that its way of moderation is controlling. While this would not be counter-productive if the person in charge of this was actually interested in the betterment of technology. Unfortunately laws are getting old and technology being fast paced is coming up with challenges that can’t be tackled with current laws. People believed in the survey that it was a big problem that while the technology was blindly accepted it was rarely tweaked according to the needs of people. The problems are largely real while in the survey people feared that we might be slow to react to the threats that include from our neighbor countries. Government has a large amount of data in its repository. Every card from ration card to driving license to Aadhar adds to the data about an individual in the government database. This information is very valuable and in the absence of any strict government concern it might be callously shared with anyone. As with government, even with many companies this is a grave issue. It is not yet built into the corporate of most companies according to the respondents. This is something that is very important. For example, if an employee leaves and his or her account is still live he is a potential threat to the company. This is an open ending that should be taken care of. Often, the security charge is given to the lowest bidder who might not be that capable. It might be the case that the technology while right might not be implemented correctly and will leave everything moot. The biggest threat comes from the belief that bad things happen to only other people. A hacker does not choose on basis of being big or small. And thus, anyone being careless is at potential risk. With technology it might happen that soon hackers might become more dangerous than actual criminals. It might be soon seen that crime gangs might make the transition to online from the offline. With the dawn of facebook and its cousins like twitter and Google+ it has become a very important part of an individual’s life. It has also become a source of personal information that will be very valuable to hackers. Individuals do not have all the information and then they look up to their government and organizations. It becomes imperative then that if these entities are lax so the individuals will be at the mercy of criminals. How many of us more tech friendly might have told our friends to not click every link they see or add every toolbar that is asked of them? And how many have find this happening anyways. Piracy is another source of viruses and Trojans and people in greed of getting free software might take the wild leap. Individual users have to learn by themselves and most are unwilling for that. Many aren’t even aware of the gravity of their actions. For example, how many of us know that piracy can actually land a person in jail. This means all the movies and songs in your laptop is enough to put you behind bars. Many people do not update their laptops even when the fix is critical because they do not know how important it is! Be it the email that tells you that you have won a million dollars or tells you that poor African kids need your help, the internet is rampant with people who want to take advantage of blind belief that people might have. Due to being a new medium many people fall for that trap. By improving awareness all across the government, society and corporations. By being proactive and act on the threats that are present. These of course are the opinions of the respondents of this survey. How many of these do you agree to? Do you think this survey captures the essence of Indian Technological situation? 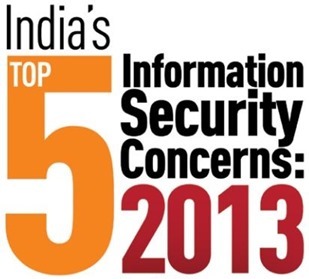 "Top 5 Information Security Concerns of India [Report]", 5 out of 5 based on 1 ratings.